You Wearing Your Hoodie Today? Trayvon Martin’s death is important because it illustrates that race continues to mark the difference between life and death. 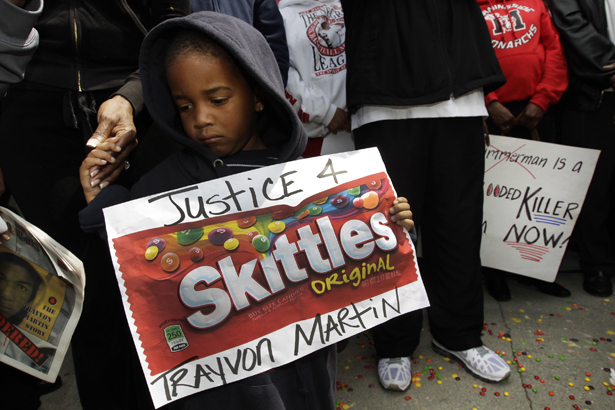 Seventeen-year-old Trayvon Martin was shot and killed by George Zimmerman one year ago today. It wasn’t the first time a young black man was killed despite being unarmed and posing no threat to his killer. At first, there was little public outcry, and it seemed as if Trayvon’s death would be swept under the rug. But within three weeks, #Trayvon was trending on Twitter, and less than a month after the shooting, the local police chief was forced to step down. It was far from the first and it certainly wasn’t the last time a young black man was killed under those circumstances. But those deaths don’t trend on social media, and police departments are running business as usual. Everyone seems to have forgotten about Trayvon and about the avoidable deaths of so many others. And that’s troubling. I am one of those people who became obsessed with Trayvon’s death last year, consuming tons of media for months on anything Trayvon-related. I pored over photos. I read countless news articles. I listened to audio. In searching back on my journal entries and social media updates from a year ago, I wrote that my obsession was about the search for justice. It still is. And for me, it feels personal. After all, my own brother was handcuffed, shot, and killed by a cop in 2004 when he was just 20 years old. He was unarmed, sober and hadn’t committed any crime aside from looking suspicious to the officers who stopped him. The similarities are substantial: nine years ago, my family didn’t know where my brother was for twenty-four hours after he was killed; Trayvon’s family didn’t know where he was for twenty-four hours, either. During the subsequent trial, the cop who killed my brother testified that he posed a threat because he had long hair; before so much as a trial, pundits like Geraldo Rivera blamed Trayvon’s death on the fact he wore a hoodie. My brother is remembered as one of the nicest people you’d ever meet; I’ve heard the same said about Trayvon Martin. When our brothers die young, they stay young in our memories forever. I try to imagine mine at 29 today. But it doesn’t work. My brother will forever be 20. Trayvon will forever be 17. And the other thing that will never grow old is the fact that I hold back tears every time I write those words. Trayvon’s death help opened up a space for me to talk about my own brother’s murder. Because I was living in New Haven and attending Yale at the time, it was especially poignant for me to recognize that so many of my middle and upper-class hoodie-clad peers, professors, friends and neighbors were open to talking about how easily racism can result in what Ruthie Wilson Gilmore calls a “vulnerability to premature death.” I wanted that conversation to continue, but after some time, it came to a pause. And while Trayvon’s death still occupies a small space in our consciousness, massive support for Zimmerman never ended. His defense fund has raised more than $300,000, and hopes to raise $1,000,000 as lawyers prepare for a June trial with the help of unpaid interns. Zimmerman’s camp is also suing NBC for defamation over playing an edited 911 call. Incredibly, the man who clearly told the dispatcher, “These assholes, they always get away,” while trying to convince him that Trayvon was a violent, drugged-out burglar, may stand to profit from the death of the child he killed who was guilty of nothing more than walking while black. Even if the Martin family had raised as much money for their work to end Stand Your Ground laws, that wouldn’t take away from the fact that race, not class, determines so much about this case. We often tend to think that money is the sole determinant of one’s status, but fail to recognize how class is mediated by race. Median black household wealth is less than $5,000, while median white household wealth is more than $110,000. When we focus solely on class, we’re fooling ourselves. A more honest approach to class would start by recalling Stuart Hall’s maxim: “Race is the modality through which class is lived.” It’s not enough for white progressives to continue to analyze class as if race is not at the center of it. The same could be said for gender. While we often think about how women don’t earn equal pay, we rarely think about how white women earn higher wages than black, Latino, and Native men. White women have benefited the most from affirmative action—which was a central demand of the civil rights movement—but as a group, often fail to address racial inequality. With the heavy news cycle, it makes sense in some ways that Trayvon has faded into memory. And it makes sense that we remember him today and will once again as the trial starts in three months. But according to a report issued last summer, police kill a black person every thirty-six hours. By that count, some 250 black people have lost their lives at the hands of cops since Trayvon’s death—and that doesn’t count vigilante murders, or the deaths of so many others who are not black, but are still targeted because of the darker color of their skin. When we allow ourselves to forget about Trayvon Martin, we allow ourselves to forget that there are so many others just like him, who leave behind mothers, fathers, brothers, sisters, partners, sons, daughters and friends who forever carry an incredible weight of injustice. Analyzing the inherent racism that allows this to occur helps us begin to understand these killings. And working to destroy the deeply entrenched system of white supremacy that lingers in society is our only option out this reality. As a writer, whether I’m publishing about something as serious as politics, as urgent as climate change, or as seemingly trivial as pop culture, my focus remains looking at race. That’s because far too often, it literally marks the difference between life and death. I’m wearing my hoodie all day today. I know many others will, too, with events planned across the United States today—including in New York’s Union Square, where Trayvon’s parents will attend a rally and vigil today. And, for at least one day again, we’ll all remember what it is we’re fighting for: our brothers and sisters, and our very lives. Read Flint Taylor’s take on police brutality in Chicago—for which Mayor Rahm Emanuel refuses to apologize.